Authorized Testimonial: "I apologize for not getting back to you sooner. I am just now playing on them, and can't seem to put them down! Your packaging was the Best!!! The pipes were snuggled safely in all the wrapping. The quality of the pipes is outstanding!! And I can't believe how fast I got them....usually takes a year of waiting! The chanter is stunning with the gold and beautiful wood. Also, thank you for the reed making info, and the leather popping strap. I think I'm all set to play. I just love your practice set, mostly because it is so easy to play. The reed is super easy. First time I got it to jump up to the second octave. I continue to play a lot, in hopes that I can get good enough to get your half set. It has been excellent therapy for me too! Once again, I appreciate this opportunity to have a set of your Uilleanns, and of such high quality! " Student Model Practice Sets: $1050 per set. By popular request, I have made up a group of D-Pitched student model practice sets. This is to supply customers with easier access to a set, in order to ascertain their abilities on the Uillleann Pipes before upgrading to an upper-line 1/2, 3/4 or full set. 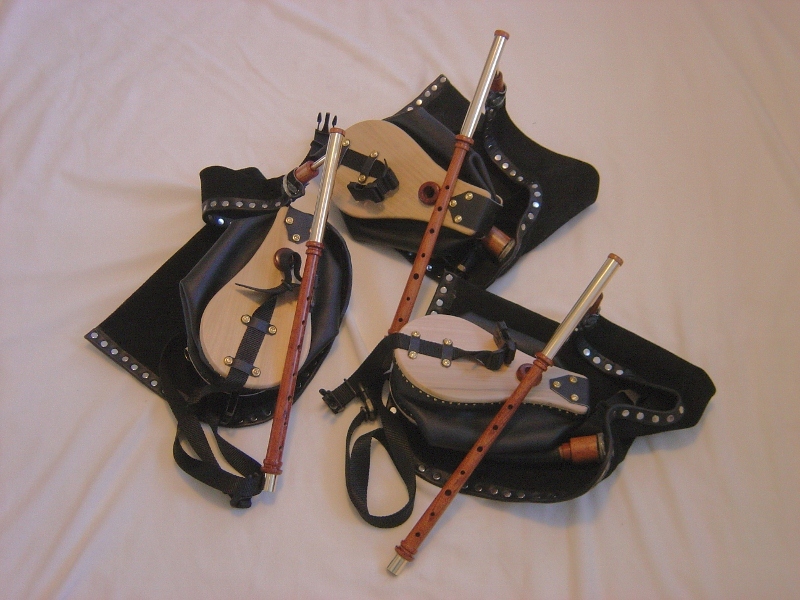 The sets pictured above are comprised of a bag, bellows and chanter (Each will be delivered with a popping leather and instructions for reedmaking.) The chanter and stocks are made from select mopane wood. 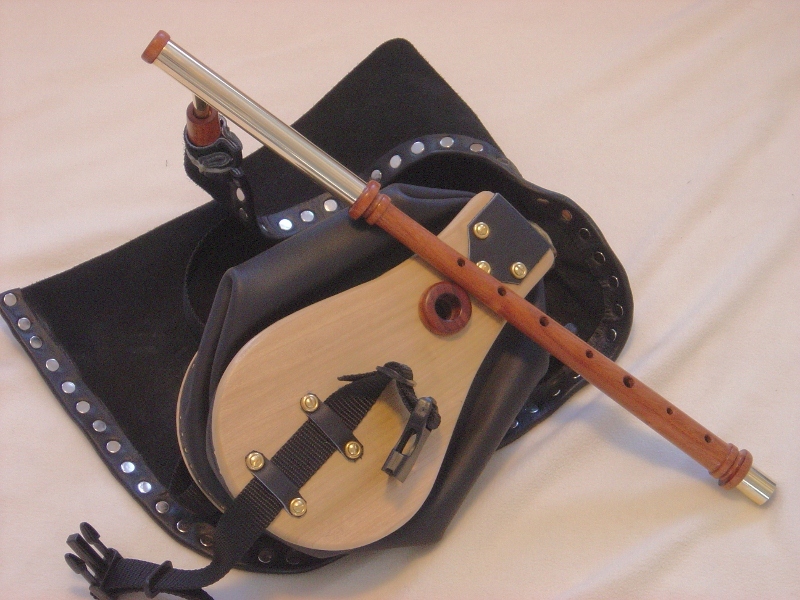 The chanter is keyless, without key mounts and the decorative mounts are integral. The metal is brass and unadorned. The bags are airtight cowhide and riveted for complete staunchness. The bellows are of the same cowhide and is glued, and nailed with brass escutcheon pins, with leather hinges on the natural finish poplar, or cherry, wood clappers. The bellows are equipped with adjustable nylon web belts and quick release buckles. These practice sets are made with the same care and attention to detail that I apply to all my sets, and the chanter/reed combinations play as well as any high-end chanter I make. It is the lack of adornment and special features that keeps the price and delivery times attractive for the beginning piper. Delivery for a Student Model Practice Set, if I don't have any in stock, is 2 to 4 weeks from receipt of full payment. These sets are priced for short delivery times at $1050 US. Delivery will be contingent on the order in which payment is received, first-come-first-serve. Here is the Special Offer: If you buy one of these Student Model Practice Sets, the price can be applied to a 1/2 set, 3/4 set or full set, in Blackwood or Rosewood, as described in my price list. This does not apply to upper-line Practice Sets in Rosewood or Blackwood. If that is the desire of the purchaser, the balance of the high-end pipe's deposit will be added to the price of the Student Model Practice Set, if appropriate. The normal lead time, price changes, terms and conditions, and warranties apply. Here's an example: Suppose you buy the Student Model Practice Set with the intention of applying the purchase to a basic blackwood full set. The deposit on the basic blackwood full set is 50% of $6200, or $3100. A $2050 deposit is added to the purchase of the $1050 Student Model Practice Set, and that will get the purchaser into the lead time cue for the full set. From there, all terms and conditions outlined here apply. The Student Model Practice Set will then be delivered to be played until the full set is ready for delivery. Also, the Student Model Practice Set can be purchased with no immediate intention of upgrading to a 1/2, 3/4, or full set. Delivery time of the Student Model Practice Set will apply. However, the owner of a Student Model Practice Set can apply the $1050 cost of the Student Model Practice Set to any purchase of a 1/2, 3/4, or full set at anytime in the future. The same deposit, lead times, and terms would, at such a time, apply. Price increases, in the meantime, also apply. Upon final balance payment on a 1/2 set, 3/4 set, or full set, the purchaser would then send the Student Model Practice Set back to me. Upon my inspection of the Student Model Practice Set, to ascertain normal wear and functionality, the 1/2 set, 3/4 set or full set will be delivered. The Student Model Practice Set is not intended to be altered or upgraded, or to have parts separated.